Throughout the company’s near-sixty year history, Rotork engineers have focused on solving customers’ problems and developing new flow control solutions. Whilst some innovations can be adopted immediately, others demand thousands of hours of testing, assessment and certification before they can be offered to customers. Continuous investment in product testing is therefore a key part of the policy, ensuring that Rotork manufactures the most reliable valve actuation products in the world. 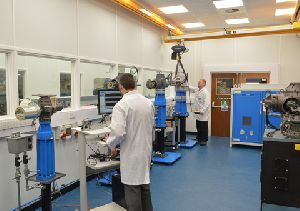 The latest evidence of this activity has witnessed the further expansion of the Product Assessment Laboratory at Rotork’s electric actuator manufacturing plant in Bath. This facility has a long and successful track record of research and development leading to the introduction of innovative and market-leading technologies including IQ intelligent non-intrusive actuation and CVA electric actuators for process control valves. In one area of the expanded laboratory, new test-rigs and data acquisition systems have been installed to enable increased testing of nuclear actuator products. Rotork’s extensive experience of nuclear operations and nuclear qualifications has contributed to the development of new products, whilst the acquisition of new businesses has further increased Rotork’s scope of supply and service to the nuclear industry. The latest electric valve actuator range for nuclear new-builds is tailored to suit the specific requirements of the internationally predominant nuclear island designs. The NE actuator range has been developed for use in EDF and AREVA (EPR) nuclear power stations. The ND DC (direct current) and NA AC (alternating current) actuator range has been developed for Westinghouse AP1000 Pressurised Water Reactor (PWR) nuclear power stations. These new designs are developments of the widely proven Rotork NA range that has been fully qualified to IEEE 382-1996/2006, comprising a simple single-stage worm drive in an oil bath gearbox, electric motor, torque and limit switches and a separate terminal compartment to which all electrical components are wired. The actuators are designed for a working life of sixty years and the new test rigs will play a critical role in confirming this ability. The increased investment in testing facilities is supported by additional manpower to meet the demands of research and development across all of Rotork’s increasing ranges of electric actuation products. Find out more about IQ range actuators, CVA and CMA range Process Control actuators and NA range Nuclear actuators.